Shri Mataji: "I wish they could accept that this is not Jihad time anymore but Qiyamah Time"
The very word Islam, which means"surrender," is related to the Arabic salam, or peace. When the Prophet Muhammad brought the inspired scripture known as the Koran to the Arabs in the early 7th century A.D., a major part of his mission was devoted precisely to bringing an end to the kind of mass slaughter we witnessed in New York City and Washington. Pre-Islamic Arabia was caught up in a vicious cycle of warfare, in which tribe fought tribe in a pattern of vendetta and countervendetta. Muhammad himself survived several assassination attempts, and the early Muslim community narrowly escaped extermination by the powerful city of Mecca. The Prophet had to fight a deadly war in order to survive, but as soon as he felt his people were probably safe, he devoted his attention to building up a peaceful coalition of tribes and achieved victory by an ingenious and inspiring campaign of nonviolence. When he died in 632, he had almost single-handedly brought peace to war-torn Arabia. Because the Koran was revealed in the context of an all-out war, several passages deal with the conduct of armed struggle. Warfare was a desperate business on the Arabian Peninsula. A chieftain was not expected to spare survivors after a battle, and some of the Koranic injunctions seem to share this spirit. Muslims are ordered by God to"slay [enemies] wherever you find them!" (4: 89). Extremists such as Osama bin Laden like to quote such verses but do so selectively. They do not include the exhortations to peace, which in almost every case follow these more ferocious passages: "Thus, if they let you be, and do not make war on you, and offer you peace, God does not allow you to harm them" (4: 90). In the Koran, therefore, the only permissible war is one of self- defense. Muslims may not begin hostilities (2: 190). Warfare is always evil, but sometimes you have to fight in order to avoid the kind of persecution that Mecca inflicted on the Muslims (2: 191; 2: 217) or to preserve decent values (4: 75; 22: 40). The Koran quotes the Torah, the Jewish scriptures, which permits people to retaliate eye for eye, tooth for tooth, but like the Gospels, the Koran suggests that it is meritorious to forgo revenge in a spirit of charity (5: 45). Hostilities must be brought to an end as quickly as possible and must cease the minute the enemy sues for peace (2: 192- 3). Islam is not addicted to war, and jihad is not one of its"pillars," or essential practices. The primary meaning of the word jihad is not"holy war"but"struggle.”It refers to the difficult effort that is needed to put God's will into practice at every level—personal and social as well as political. A very important and much quoted tradition has Muhammad telling his companions as they go home after a battle," We are returning from the lesser jihad [the battle] to the greater jihad," the far more urgent and momentous task of extirpating wrongdoing from one's own society and one's own heart. Islam did not impose itself by the sword. In a statement in which the Arabic is extremely emphatic, the Koran insists," There must be no coercion in matters of faith!" (2: 256). Constantly Muslims are enjoined to respect Jews and Christians, the"People of the Book," who worship the same God (29: 46). 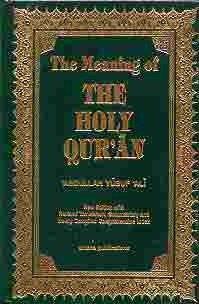 In words quoted by Muhammad in one of his last public sermons, God tells all human beings," O people! We have formed you into nations and tribes so that you may know one another" (49: 13)—not to conquer, convert, subjugate, revile or slaughter but to reach out toward others with intelligence and understanding.